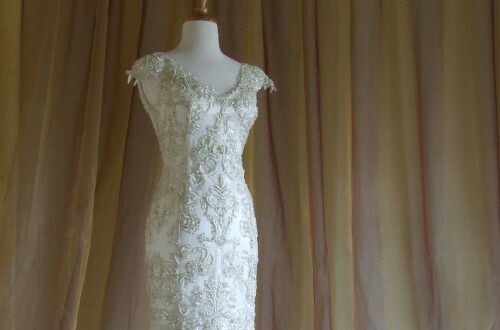 Lace Wedding Gowns are really on trend this year and with that in mind, I’d like to share my process for a custom lace gown that I made recently for a New Year’s Eve wedding. After consulting with the client, we decided on an ivory beaded Alencon lace re-embroidered with gold thread. 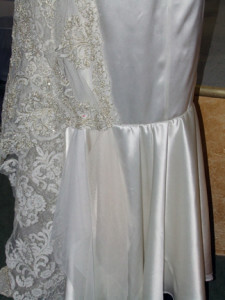 The base was a 40mme silk charmeuse, lined in silk habotai. 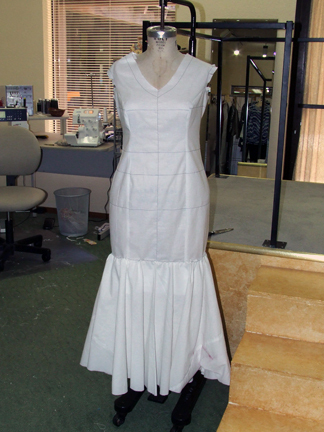 I like to prepare a fabric “sketch” for the client so she can see how the fabrics look and feel together. 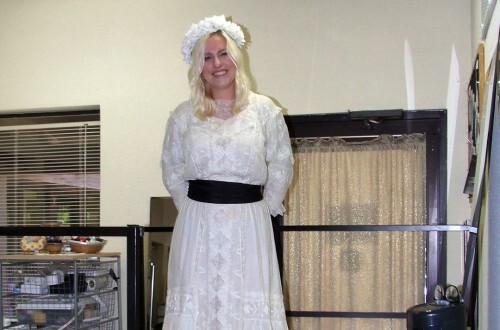 I had to tea dye the English netting to match the ivory of the lace. Shown here are samples of the dyed netting. I used muslin for the toile which worked perfectly for the silk but the lace was so stretchy that I ended up taking it in twice to get the “va-va-voom” fit that the bride desired. 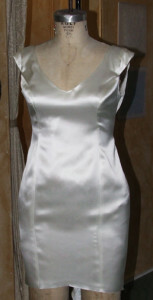 First, I made the silk sheath and fit it exactly to the bride’s body. We also made sure the neckline was just as we wanted. 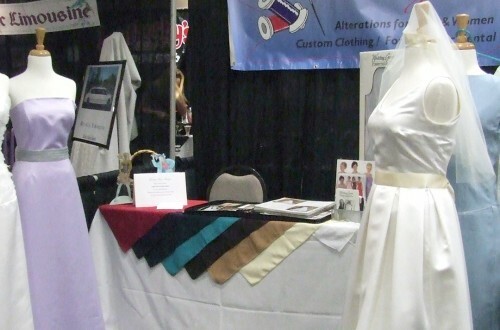 The bride wanted the necklines as low as possible but we also had to fit her undergarment. 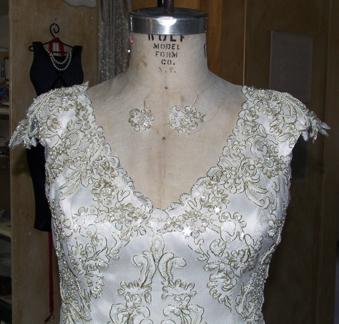 Next, we added the lace over the silk sheath. This is where I took in the lace twice to get a really close fit. Once I got the fit we wanted, I could finish off the neckline and sleeves. 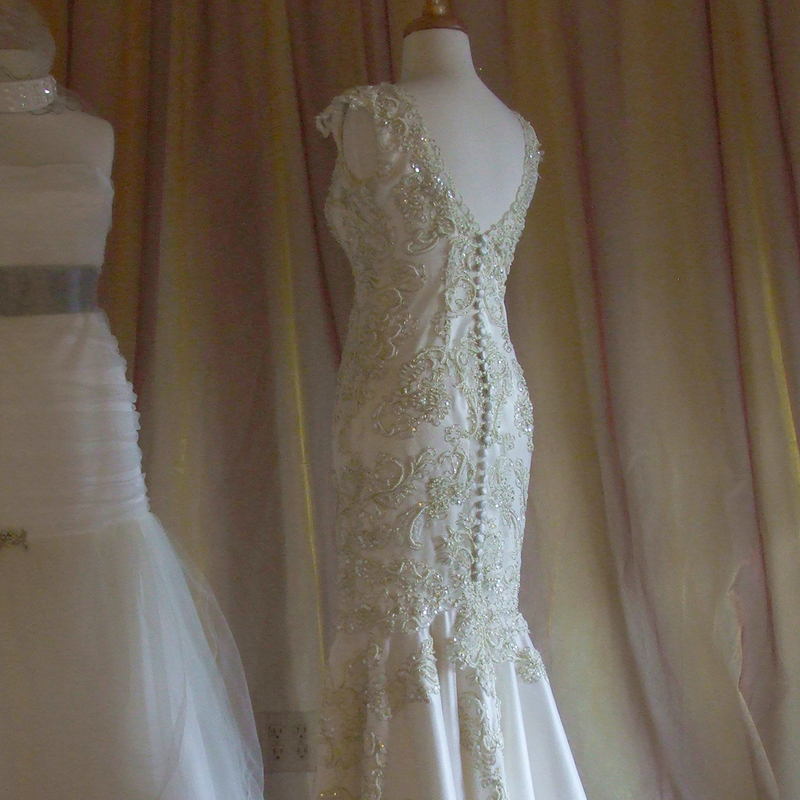 Then the fun part ~ placing the lace on the skirt of the gown! Here’s the “sketch” with the happy bride. I ended up changing it somewhat in the final so that the design was balanced. 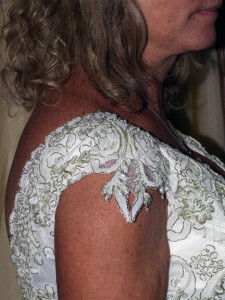 It was not a symmetrical lace so it had to look balanced as opposed to symmetrical. 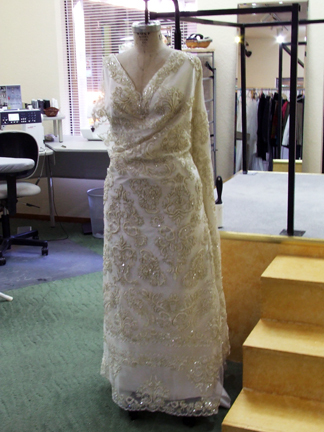 And here is the finished gown!